With all these “Insider’s guides” coming out, we’ve opted for an “Outsider’s guide” for all of those who might be visiting AMI for the first time. Ask anyone on the island and these are the restaurants you most likely will be recommended and end up visiting on your first visit…..and your second…..and your third…….If you want to know the places that people don’t tell you about, click here. If Anna Maria has an “inn place”, this is it! Situated on the beach at the end of Spring Avenue. Live music. Here’s where you’ll have the most crowds on any given day. Every evening you can guess the exact time that the sun sets and compete for a bottle of bubbly. Just don’t do what we did: Arrive just in time for the sunset and be seated in the bar awaiting a free table. You can’t compete if you’re not in the dining area. Guess who guessed right to the second? Tomas will never get over this mistake! The Bradenton Beach equivalent to The Sandbar. Not surprisingly they have the same owners. No bubbly competition though. Holmes Beach’s place to eat on the beach. Famous for it’s “all you can eat” pancakes and sausages breakfast. This is where we normally fill our bellies to the brim before doing a trip to Busch Gardens. You last long before needing a top-up! Friday evenings they have a drumming circle where you can help drum down the sun. Might not be the place for your average family dinner outing. This is one of the best restaurants in Florida, and priced accordingly. 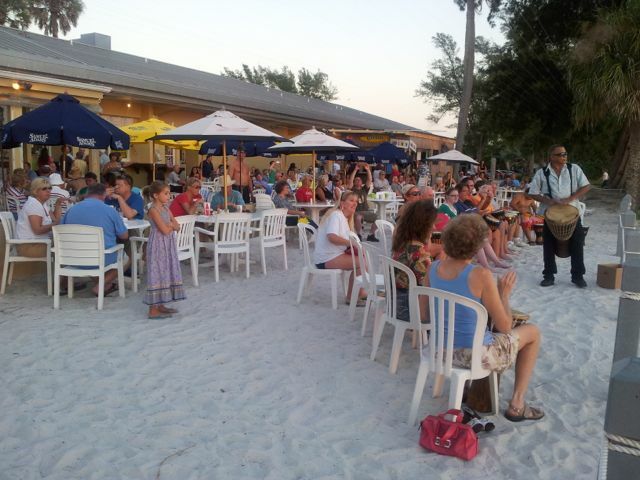 Your best chance to see a celebrity on Anna Maria Island. Not content with being on the beach? You want to be on the water? These are the places to be. Great places to get a bite and a genuine “Old Florida” feel (actually they are sooo Old Florida that they don’t even have their own websites) while watching the Sunshine Skyway Bridge over Tampa Bay and people fishing from the pier. GINNY’S AND JANE E’S AT THE OLD I.G.A. Get a kitsch overload while eating your breakfast or lunch at this place. They sell everything in the store, so you might end up with an interesting chandelier made of grandma’s best china, or a metal egret. Great burger joint located close to Manatee Public Beach parking area. We love their curly fries! 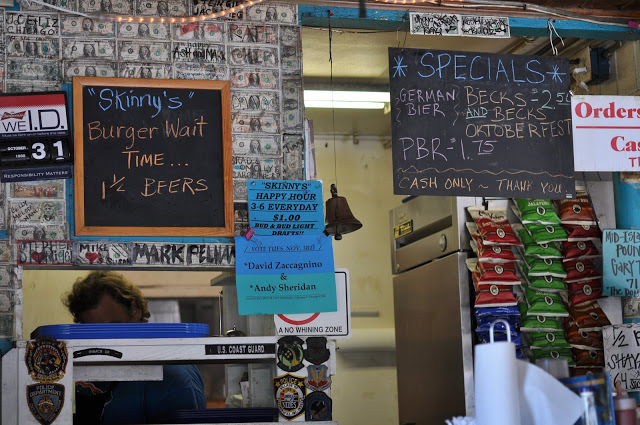 They write their estimated waiting time on a black-board – not in minutes, but in beers! Just remember: cash only and Mondays closed……and no air-conditioning…..
Voodoo theme Caribbean restaurant with a “don’t even ask” policy about seasoning. The food is already seasoned to perfection. You can however buy extra in the reception. We always buy their “Magic Dust” dry rub in a round metal can. Not spicy in spite of the fierce orange color. You can use it on most everything and also as a give away instead of flowers or a bottle of wine. We like to travel light, so it’s perfect as you can bring it onboard the flight in your hand luggage! We also have an insider’s guide for the gems that might not be immediately found. We send it to anyone that subscribes to our newsletter! It’s hard to keep a secret on Anna Maria Island. The island is just too small! It’s not easy to find a decent Mexican style restaurant anywhere. Poppo’s uses fresh organic ingredients and antibiotic/hormone free meats. Made to your specifications. Expect to wait while they are made, lines are often long. But the reward is amazingly fresh donuts that just may redefine how a great donut is supposed to taste! You fill out an order with the preferred icing and topping or choose one of the ready made combinations on the bottom of the order form. (My favorite is the Key Lime). Just be aware that their opening hours are 7AM to 1PM, Tue – Sun. Probably one of the best priced restaurants on the island for what you get served. Many locals consider their rack of ribs to be the best on AMI. This restaurant is also mentioned on the “outsider’s list”, but I thought it might be in order to highlight their breakfast, which is a wonderful way to start the day. At $12 (2014 price) their Seafood Omelette is the most expensive on the breakfast menu, and it is really a great option if you like seafood! They open at 8am which is later than most breakfast places on the island. For more insider’s advice look at the post below! You will need to subscribe to our newsletter to open it up.